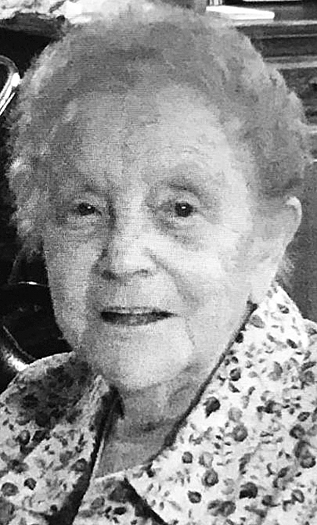 Pauline Gunsallus Murty, 93, of West Fourth Street, Lock Haven passed away March 13, 2019 at the Haven Skilled and Rehabilitation Nursing Home in Lock Haven. She was born in Liberty Township, Centre County Nov. 7, 1925 to the late Grover and Ada Glossner Gunsallus. Pauline was united in marriage Dec. 31, 1960 to Harrison E. Murty who passed away Feb. 17, 2002. She was a graduate of the Lock Haven High School and had been a member of the Lock Haven First Church of Christ. Pauline had worked for the Keystone Central School District in the housekeeping department retiring after 25 years of various service. She enjoyed camping, trips to Canada and enjoyed exercising. Memorial Services for Pauline G. Murty will be held Saturday, March 16, 2019 at 11 a.m. in the Yost-Gedon Funeral Home & Cremation Services, LLC, 121 W. Main St., Lock Haven. Family and friends will be received in the funeral home one hour prior to services. Officiating will be Pastor Steve Salmon of the Lock Haven First Church of Christ. Interment will be in the Rest Haven Memorial Park Lock Haven. In lieu of flowers, memorials can be made in Pauline’s name to American Heart Association, Lock Haven First Church of Christ or the Children’s Library at the Ross Library through the funeral home.